Why should I upload my GEDCOM to MyTrees.com? How do I create a GEDCOM? How do I upload my GEDCOM to MyTrees.com? How do I update my file at MyTrees.com by uploading a new GEDCOM? How much free time will I get for uploading my GEDCOM to MyTrees.com? Will other people be able to download my GEDCOM? Will the living people in my GEDCOM be displayed on the site? I have a Mac computer. Can I still upload my GEDCOM? I have pictures in my family tree. Will those be uploaded with my GEDCOM? I've uploaded my GEDCOM. Now what? How do I download a copy of the file I have submitted to MyTrees.com? How do I download a copy of a file I found in the Ancestry Archive database? I clicked the Download button, but all that came up was a bunch of text. What happened? Can I keep my GEDCOM private? GEDCOM is an acronym that stands for GEnealogical Data COMmunication. Basically, a GEDCOM is a simple text file that can be created and read by any genealogy program. When you enter your family history information into a genealogy program, such as Legacy or Family Tree Maker, the program automatically stores that information in its own, unique format. So, Legacy files can only be read by the Legacy program and Family Tree Maker files can only be read by the Family Tree Maker program. What do you do if you want to share information with someone who uses a different program than you do? That's where GEDCOMs come in handy. All genealogy programs also have the ability to export your family history information in GEDCOM format, which can in turn be read by any other genealogy program. A good way to think of it is as a common language that all genealogy software programs can understand. When using MyTrees.com, you will come across the term GEDCOM in two cases. First, if you want to submit your family tree to us in order to share it with others and to receive a free month of our subscription services, one way you can do so is by uploading a GEDCOM. Second, if you would like to download information from our site (either from your own file or from a file you have found in one of our databases), the information will be saved in GEDCOM format on your computer. Submitting your file to MyTrees.com gives you another backup copy of your family history data. We often hear from distressed genealogists who say their computers have crashed and their backup disks are unusable. 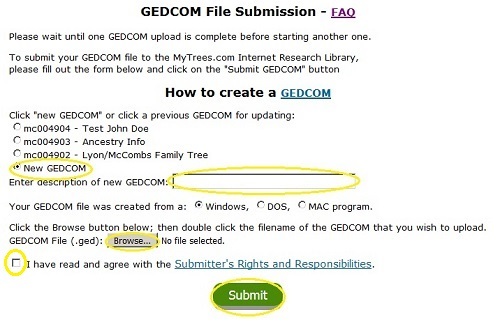 If they have previously submitted their GEDCOM to us, the solution is as easy as downloading a copy of the file. Here at MyTrees.com, we backup every file in our database not once, but four times. This insures that no matter what happens, we will always have a copy of your complete file stored on our server. If you upload your GEDCOM to us, we'll give you free access to our subscription database. Any file that contains at least 60 individuals and 15 families will receive one free month. Depending on the size of the file, you could receive up to four free months. Please note that this is a one time offer, so be sure to upload your largest file first. When you upload your GEDCOM to us, it becomes part of our Ancestry Archive and anyone searching our site can find it and see what names you are researching. This makes it easy for others with similar research interests to contact you in order to share information. You can register a Family Password in order to give your family members complete access to your file. This free service is a great way to share your genealogical finds with relatives over the internet. Any genealogy program can create a GEDCOM. However, sometimes certain genealogy programs place information in a GEDCOM that can't be read by any other program. This raises the danger of losing that information when the GEDCOM is imported into another program. Our website has been carefully designed so that it will never lose data. If something is not understood by our program, that information is placed in the notes so that it is still available. The above instructions are based on specific versions on the programs. If you have another version of the same program, the steps may be slightly different. Hopefully, our instructions will still help. If not, we encourage you to search for GEDCOM in the program's user manual or help files or to contact the customer service department of the company that produced your program. If you have any difficulty downloading a GEDCOM from My Family Tree, please contact us. If you would like more information on GEDCOMs, please see What is a GEDCOM? Please note that if you have been using our My Family Tree genealogy program, you do NOT need to submit a file. Your account will be automatically activated when your file becomes eligible to receive a free month. Go to our homepage at https://www.mytrees.com. Click the "My Family Tree" link located at the top of the page. Then click "Upload GEDCOM". You will now be on the GEDCOM File Submission page. If you are uploading a NEW file, select "New GEDCOM." If the file that you are submitting is an UPDATE of a file that you had previously submitted, click the circle in front of the file that you wish to update. Give your file a name by typing it into the "description" field. (No one else will be able to see this name. Naming your file can help you distinguish it from other files that you may have in your account. You can choose anything you like, but most people use a surname.) If you are UPDATING a file already attached to your account, you will still need to retype the name in the "description" field. Click the BROWSE button. The file extensions .ftm and .htm will not create a GEDCOM. Make sure the file ends with a .ged. Some computers do not display the file extensions. In this case you will need to view the file extension by looking at the properties of the file. Select the drive and folder in which your GEDCOM is saved. Select the file name and then click OPEN. This will place the correct path to your file into the submission form. Click the Submitter's Rights and Responsibilities link. This will bring up a smaller window, where your rights and responsibilities as a submitter will be listed. Read through the document. If you agree to the terms, click the check box next to "I have read and agree." 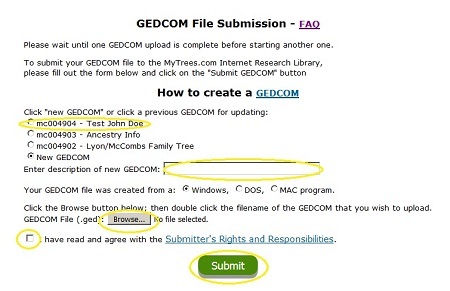 Click the SUBMIT GEDCOM button. Your file will then upload to our site, where it will be attached to your account. Please be patient if you have a large file. It can take up to 5 minutes per meg to upload, depending on the speed of your internet connection. You will see a confirmation screen that will tell you when the file has completely uploaded. We will also send you a confirmation email if your account has been activated for your free month, if you have not already received one. If you do not see the BROWSE button, or if you have any other problems submitting your file online, you are welcome to send us your file by one of the following methods. or by calling us at (801)229-7967. Click the "My Family Tree" link located at the top of the page. Then click "Upload GEDCOM." You will now be on the GEDCOM File Submission page. Any file(s) that you have already submitted to MyTrees.com will be displayed on this page. Find the name of the file that you wish to UPDATE and click the circle in front of that file. Give your updated file a name by typing it into the "description" field. Even if your file already has a name, you will still need to enter it again when updating. You can simply retype the original name, or give it a new name. Your original file will then be removed and replaced by the new, updated GEDCOM. Please be patient if you have a large file. It can take up to 5 minutes per meg to upload, depending on the speed of your internet connection. You will see a confirmation screen that will tell you when the file has completely uploaded. If you upload a GEDCOM to My Family Tree that contains at least 60 individuals and 15 families, you will be eligible to receive one free month of our subscription time. Larger files may be eligible for additional time. This is a one time offer and will be based on the first file you upload. You will not receive additional free time for updating the file on a later date. or by phone at (801)229-7967 for an estimate of how much free time you would receive. Once you have uploaded a file to MyTrees.com, it becomes part of our Ancestry Archive, where it can be viewed by our other patrons. Small portions of a file (up to 6 generations at a time) may be downloaded from the Archive. However, no one will be able to download a complete copy of your GEDCOM from our public archive. There are only two places on our site where a complete copy may be downloaded. One is in our My Family Tree program, which you would use to view and edit your own file. You can always download either part or all of your file from My Family Tree. (For instructions on how to do so, see How do I download a copy of the file I have submitted to MyTrees.com?.) No one else can access your file from My Family Tree. Your file can also be viewed and downloaded from the Family Access login. Family Access allows your family members or friends to view your complete file (including living individuals) and to download part or all of the file. In order to view your file through Family Access, they will need your account number and family password (which is a separate password that you can set up for this purpose; it is NOT the password that you use to login to your account). Only someone to whom you had given this family password would be able to download your entire file. This allows you to maintain control over who has a copy of your complete GEDCOM. Here at MyTrees.com, we protect the privacy of living individuals by NOT displaying their names in our database. Our system automatically determines which individuals are still living by birth date. As long as you've included birth dates for all living people, their names will not appear in the Ancestry Archive. If you do not know the exact birth date of a living individual, you can list an estimated birth year or even a year range to prevent them from showing in the Archive. Please note that while living people will not be displayed for public viewing in the Ancestry Archive, there are a couple of places where they may be shown. First, when you login to your own account in order to view your file through My Family Tree, you will be able to view information on living individuals. Second, if you are logged into your account and doing searches on the site that lead you to your own file, you will be able to see all the individuals in it. This is because the site recognizes you from your login and so allows you to see that information. The living individuals are not available for public viewing. Third, those who access your account through the Family Access login will also be able to view the living individuals. However, you decide if you would like to register a family password or not and you decide who gets access to that family password. So, the only people who would be able to see living individuals in your file would be you yourself and any family members or friends to whom you have chosen to give your family password. This allow you to maintain control over who can view information on living individuals in your file. Yes. Our website has been designed to read and process all GEDCOMs, including those created by Mac programs. If you upload your file and the site does have any problem processing it, the GEDCOM would be reviewed by a member of our staff. At that point, we would either be able to manually upload the file to the site or we would contact you to let you know what went wrong and how to fix the problem. Once you have uploaded your GEDCOM to us, you can start using our services to extend and share your family tree. If this is your first GEDCOM upload and it contained at least 60 individuals and 15 families, you will have received a free month, giving you access to our full database of genealogical files and records. To start searching, go to our homepage and log into your account. That will take you to a search screen. My Family Tree: My Family Tree is a free genealogy program that you can use to view and edit your file right on our site. You can also print out pedigree charts, download a copy of your information, and much more from My Family Tree. Family Access Login: When you set up a family password, your family members can view the file you have submitted without needing to have their own MyTrees.com account. They just need your account number and family password and they'll be able to view your entire file. Only you will be able to edit your file, though, so you can maintain complete control over your own data. Please note that a family password is NOT the password you use to log into your own account. You can set up a separate family password by selecting "Set Family Password" from the My Account menu on our site. Every Name Search: Once you've submitted a file to us, you can use the Every Name Search to search for every name in your file at once. This allows you to quickly gather in possible matches without doing hundreds of individual searches. You can also do just an End of Line search, which only searches for individuals who are missing parent or spouse names. You will need a subscription to view the full results of your Every Name Search, however, so if you received a free month for your file, make sure to try this comprehensive search before your free time runs out. Click "My Family Tree" from the top menu. Your file should then display. If you have submitted more than one file, you may need to select the correct file by clicking the "Select Tree" icon from the top menu. From the File Selection page, select the file you wish to download and click the SUBMIT SELECTION button. When the correct file is displaying, click the "Download Tree" icon from the top menu. Select what type of computer you are using: PC or Mac. At the top of the Save window, you should see a scroll box titled "Save In." This tells you where the file will be saved. You can change the Save In location by clicking on the scroll box and selecting a new location. Make sure that you remember where you are saving the file, though, so you can find it again later. 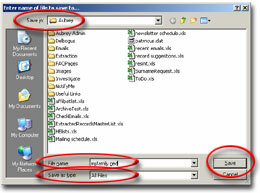 At the bottom of the Save window you will see a "File name" field. Enter a name for your file here, adding a .ged extension at the end. For example, MyFile.ged. Below the "File name" field, there should be a "Save as type" or "File type" scroll box. From this scroll box, select either All Files or Text (*.txt). Find the Download area that appears below the pedigree chart. Click the scroll box to select the number of generations you wish to download. The download will start with the family currently listed in the first position on the pedigree chart. You can only download up to six generations at a time from the Ancestry Archive. If you wish to have a copy of the complete file, you will need to contact the submitter and request that they send you a copy. Submitter contact information can be found at the top of the file. Select what type of computer you are using: PC, WebTV, or Mac. You will notice that there is also a MyTrees option. If you have already received a free month for submitting a file that contains at least 60 individuals and 15 families, you can use the download area to copy information from a file in the Ancestry Archive to your My Family Tree file. You are accessing the internet through a WebTV or other TV console device. If that is the case, then you probably can not download information because there is no computer to save that information to. So, the GEDCOM file will simply display as a text file on your screen. If you are not able to download information, we suggest that you go ahead and view the file on our site. If you are able to print information, you can use the Print Pedigree or Print Displays links to print off a copy of the pedigree chart. Click your browser's File menu. That should bring up a small Save window. Use the "Save In" option to select where you would like to save the file. Enter a name in the "File name" field, ending it with a .ged extension. For example, MyFile.ged. 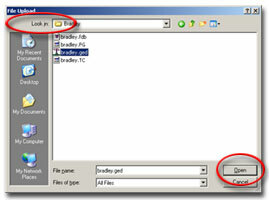 Set the "Save as type" or "File type" option to All Files or Text (*.txt). The GEDCOM file should then be saved to your computer. Make sure the correct file is displaying. If you have more than one file, you may need to click the Select Tree link at the left to select the correct file. Click the Make Private link from the menu at the left. Your file will the be made private. It may take up to 24 hours for all references to your file to be entirely removed from the public database. You may make as many of your files private as you wish. If you cancel your subscription to MyTrees.com, your files will automatically be made public again.